The Nuclear Decommissioning Facilitation Corp (NDF) held their annual meeting recently. 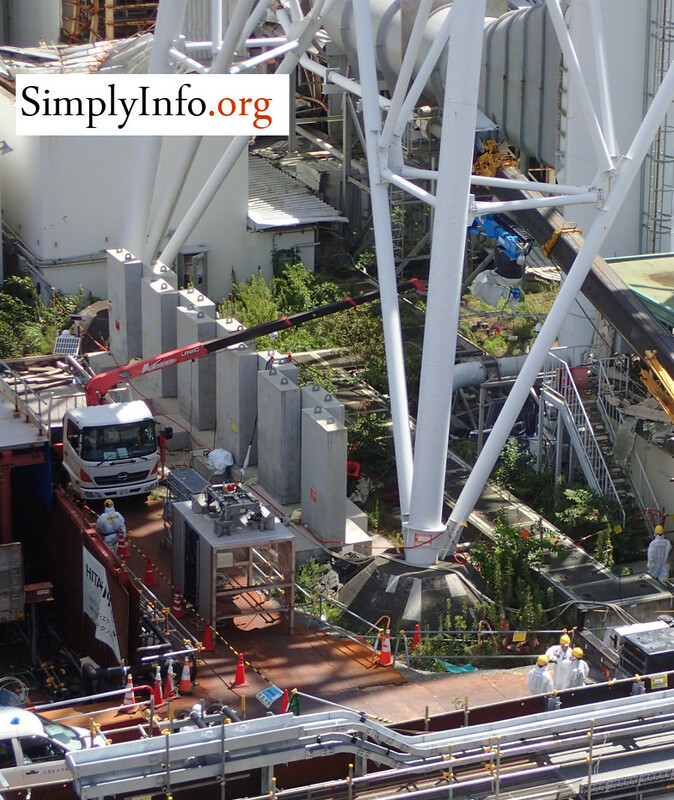 Presentations by various experts and those involved with the investigations at Fukushima Daiichi give some significant new admissions about what is now known about the disaster. Due to the amount of data, we are publishing on each unit separately. Quotes from the report are in italics, our commentary is in bold text below in each section. A conclusion section is available at the end of this report if you wish to jump to that information. It was noted that pressure and steam may have caused contamination to travel through the RCW system. 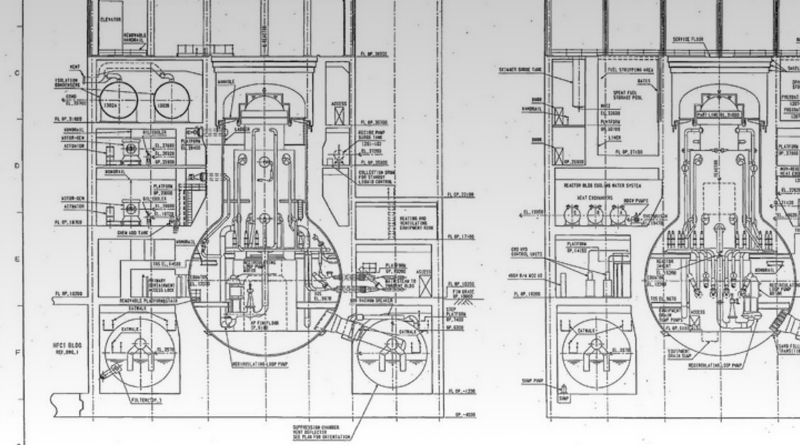 The “RCW” system appears to either be the system used to spray water into the PCV (containment structure) and the suppression chamber or possibly a system that provided cooling to pump system motors. Our notes showed that the last action of the containment spray system at unit 1 was to turn it on and direct it at the suppression chamber (aka: the torus). 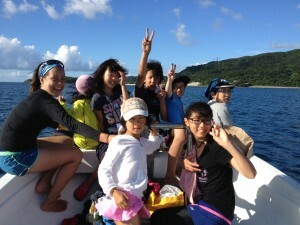 This was before the tsunami hit, knocking out power. The loss of power may have made closing the system no longer possible. This would have left a route open to contaminate the piping. 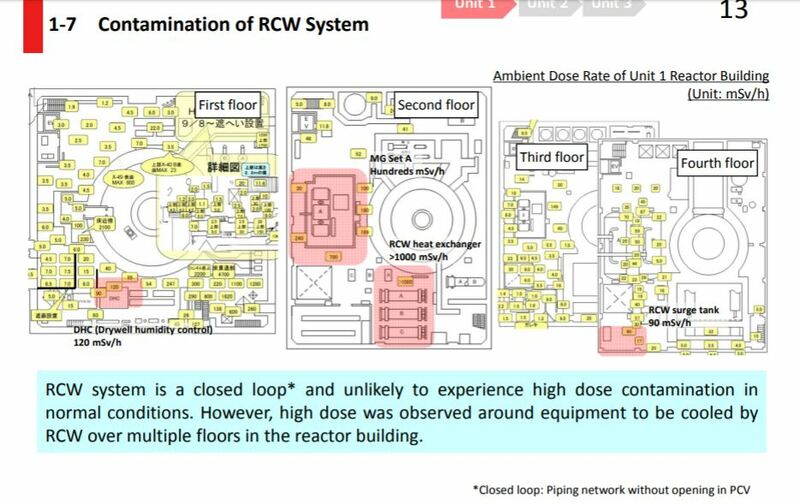 The diagram (from the report) above shows various locations along the RCW system that were found to have elevated levels of radiation, highlighted in red. 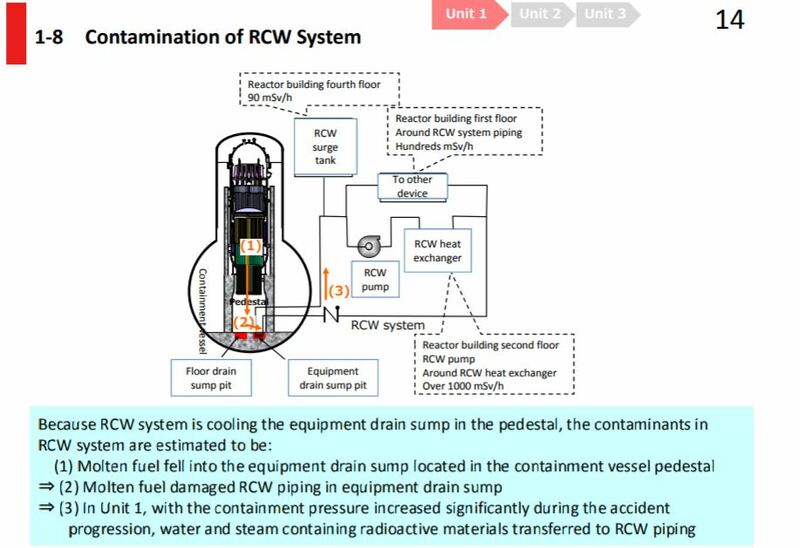 The explanation in the above diagram is the assumption for how the RCW system became contaminated. This finding may not indicate anything new and significant related to the meltdown itself. It does explain how certain pipes in the reactor building areas became highly contaminated. It does not explain, if the RCW system was spraying the suppression chamber rather than spraying containment, how it would replenish water. These two areas located at the top of the containment structure include the bolt on containment cap, the refueling reactor well area and the concrete cover pieces that are installed on top of the containment cap when the reactor is in operation. This containment cap is a known failure point during a meltdown scenario in a Mark 1 BWR reactor. This confirms that the gasket for the containment cap (PCV top head) is failed and allowed steam and fuel particles (FP) to escape the reactor. High levels of radiation near the containment cap were found and considered to confirm this. It is worth noting that in the days following the initial disaster little or no steam was seen coming out of unit 1’s refueling floor level, unlike units 2 and 3 that produced considerable amounts of steam. The heat found directly above the reactor is assumed to be due to fuel particles stuck to the concrete shield plug. This would again confirm reactor fuel particles were released from containment and potentially to the wider environment. They also note the displacement of the concrete shield plug, something that was confirmed by earlier visual investigations. 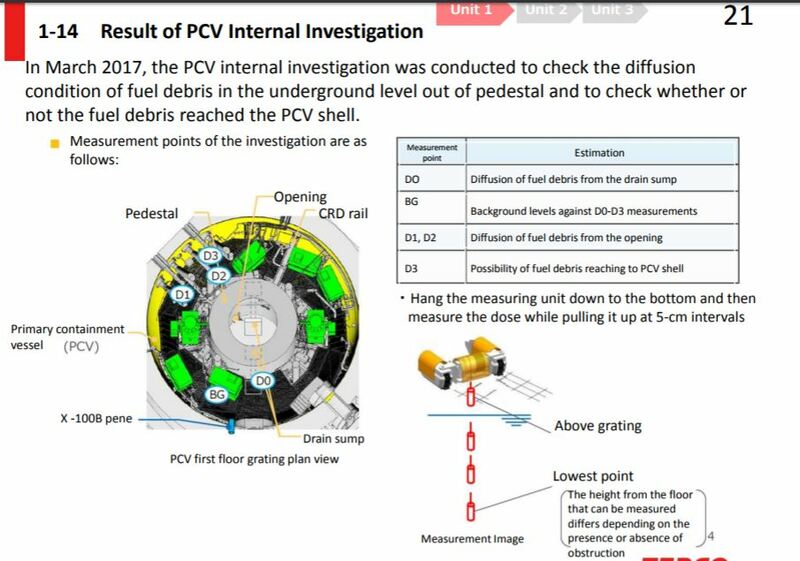 All of this appears to confirm that to some extent fuel particles were ejected from unit 1. This failure also allowed the escape of radioactive gasses to the environment during the initial meltdowns. These notes on a discovered heat source may provide hints where some of the melted fuel has deposited. The temperature sensors located in the HVH (Heat Ventilating Handling Units) units inside containment provided data to help estimate a possible fuel location. Based on temperature fluctuations they assume there may be some fuel in the north side of containment, or possibly just the north side in the pedestal area. When looking at the entire reactor building, this would be the side below the spent fuel pool (but inside containment). Fuel debris may be widely dispersed around the containment structure bottom and beyond. Unit 1’s curious lack of an obvious melted fuel mass location has been a long time cause for concern. The list below is considered to be the mix of melted materials in the reactor pressure vessel. Fuel debris aka: corium found further outside of the reactor vessel could include these material. The materials list illustrates that the research agencies have established a better idea of what they expect to encounter. Multiple locations have been found that indicate routes for water to leak to the torus room. This confirms another route of containment failure or potential routes for fuel to escape containment. There are assumptions that molten fuel exited the pedestal via the lower doorway and deposited on the drywell floor. It is also noted, the pedestal itself that holds up the reactor vessel may have suffered erosion at the base of the walls due to the molten fuel. While multiple comments are made about the possibility of fuel debris in the drywell area, they are still unable to confirm a fuel mass. The mention of “MCCI” refers to the molten corium concrete reaction. This is a process where the molten fuel mass burns and erodes concrete surfaces it comes into contact with. ・If water is pooled on PCV floor, particulate debris will be formed. A significant admission in this area is that there may have been a failure in the upper reactor vessel. This could include the rupture of a main steam pipe. During the earthquake all of these lines are closed by MSIV valves to isolate the reactor piping from the turbine building. During the meltdowns the steam relief valves (SRV) were never activated. This series of valves are used to release pressure from the reactor vessel into containment via the torus. This lack of pressure build up in the reactor vessel seems to confirm the conclusion of a pipe break on the reactor vessel. 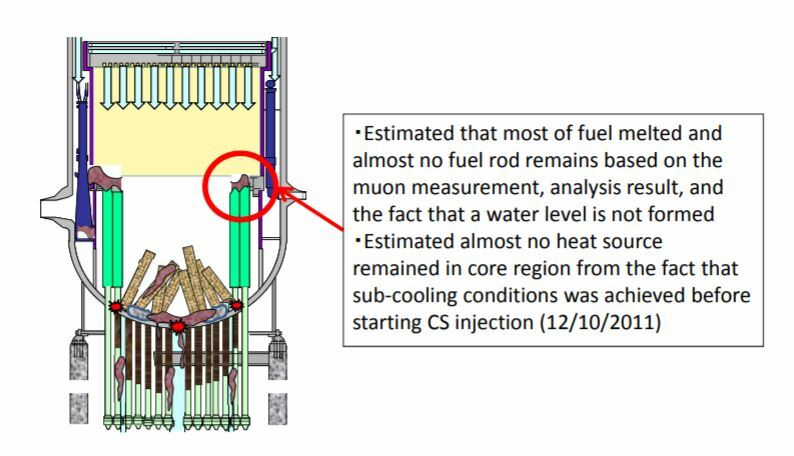 It is estimated that no fuel remains within the reactor vessel except for some small debris. 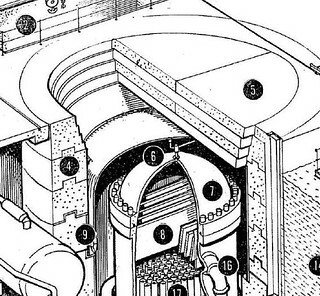 The various systems inside the reactor vessel including the shroud and pump systems are assumed to be severely damaged. ・For Unit 1, water injection from CS system started on December 10, 2011. Before that, however, most of the observation points in the containment vessel fell below 100 ℃. Therefore, estimated that almost no fuel remains in the core. These components along with parts such as the shroud and jet pumps that reside inside the reactor vessel are assumed to be heavily damaged. This will matter in relation to any decommissioning effort. These pieces could be in unpredictable configurations and conditions making cutting and removal more challenging. ・ Analysis results pointed out downward shifting due to creep deformation and deformed support casting. The torus room and torus (suppression chamber) estimates give some insight into ongoing concerns about the state of this area. The “high Cs concentration” on building walls inside the torus room follow earlier findings of significant damage, scorching and high radiation. A 2012 scope inspection of the torus room found what appeared to be fuel debris under the standing water. It is quite possible that some fuel was ejected into the torus room causing these findings. A clear pathway for this has not been found to date. Also mentioned is that the torus tube itself is mostly sound, it does appear to hold water and likely holds at least some fuel debris due to the gas generation and high radiation levels along the tube. The assumptions for this area may be partially based on their findings from unit 2. Actual inspection inside the pedestal has not been done to date. It is assumed that all the fuel left the reactor vessel and would have melted the structures directly below in the pedestal as was found at unit 2. The larger cause for concern is the amount of erosion to the pedestal base. If this is found to be significant it could cause problems related to supporting the reactor vessel and other structures inside containment. There may need to be inspections specific to this before actual decommissioning efforts take place. ・ The chemical form (water-soluble/water insoluble, etc.) of adhered FP is unknown. These findings appear to implicate unit 1 as the cause of the high radiation levels in the shared vent tower for units 1 and 2. A 3 Sv/h reading was found in piping before the SGTS (standby gas treatment system) filters. High contamination was found further along the pipe system into the tower. It is also claimed that high radiation was found on the down stream side of the SGTS filter banks in unit 2 and that a rupture disc in unit 2 never worked. If this is the case then unit 1 would likely be the cause of the high contamination in both the unit 1 system and the downstream side of the unit 2 system. Based on wind patterns during the days of the individual meltdowns it has been assumed that unit 1 caused most of the high contamination fallout zone that runs north and west of the plant. These deposits were found on an inspection years ago. At the time this high level of radiation wasn’t mentioned. What the deposits could be isn’t clarified. The HPCI system operation wasn’t attempted at unit 1 during the meltdown response. This pipe is in a small room that includes a personnel air lock for containment. These two findings confirm some significant events. The 5 Sv/h reading near the SGTS room further confirms that significant contamination left unit 1 via the vent tower. This room sits in a small building that connects the reactor building and the turbine building and was categorized as part of the turbine building reporting in the NDF report. The relationship between the containment failures into the torus room and a migration path into the turbine building is further confirmed. This links the containment failure to the torus room water and then to the turbine building. Other reports have cited an opening in the lower levels of the turbine building that allowed highly contaminated water to flow out of the building towards the sea front. The groundwater contamination maps further confirm this, that unit 1 may have openly leaked into the groundwater and then to the sea for years before any effort was made to block this. 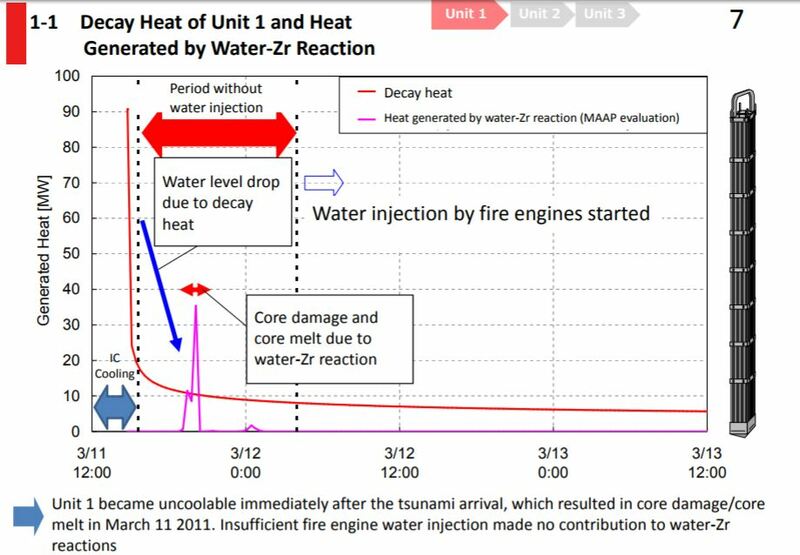 The graph below shows the drop in decay heat after shutdown along with heat generated by the zirconium fuel cladding and the remaining water. The reactor water cooling system appears to be contaminated. Containment leaked via the reactor well and has a failed gasket, this likely allowed some amount of fuel particles and radioactive gasses to escape. There may be some amount of fuel collected in the north side of containment. The containment drywell failed into the torus room and torus tube to some extent. The torus room and outer wall contains highly radioactive materials. Contaminated water from the torus room leaked to the turbine building basements. The reactor pedestal may have suffered erosion at the base causing instability. There is some evidence of debris in the drywell but they can’t find a mass of fuel. The reactor vessel likely suffered a pipe break type failure in the upper section, possibly on the steam pipes. No significant amount of fuel remains in the reactor vessel. Reactor vessel internal structures are likely destroyed or heavily damaged. There is an assumption that equipment in the pedestal region is heavily damaged. Unit 1’s vent piping systems are highly contaminated. Unit 1 is the likely cause of the vent tower contamination. We will continue this series here at SimplyInfo.org by reviewing the same documents for unit 2 and 3.